Peter Burling with the Finals trophy. Down to the final two America’s Cup Challengers – first to five points on the scoreboard has the privilege of facing the Defender, ORACLE TEAM USA in the AC Final. Excitement in Bermuda was palpable. This was what the five Challenger teams had been working towards for more than two years. It had been both an exhilarating ride and a nerve wracking ride for the five Teams. Already eliminated were France, Japan and Britain. Japan and Britain were first time competitors and they had a lot of ground to make up compared to other teams. Other factors contributing to their elimination were: underfunding, design and engineering problems, personnel constraints and on the water human errors. By comparison, Emirates Team New Zealand has many successful campaigns under their belt, but Artemis Racing was extremely well funded. An added incentive is New Zealand wants to vindicate themselves against their arch rival and nemesis ORACLE TEAM USA. Both Teams have great young helmsmen. Both are super competitive high achievers. Pundits predicted very close racing. Coming down to the nail biting conclusion of the Challenger Series the old adage “fastest boat always wins” seemed to be true. Putting money, time and effort into designing the best boat paid off. The America’s Cup has always been about pushing the limits of design and technology. This is especially true in the 35th Cup where foiling catamarans have the potential to go four times the speed of the wind. These are more like flying machines than sailboats. Perhaps we should be calling the helmsmen pilots rather than sailors? Team New Zealand bought into the concept of leg powered grinders called ‘cyclors’ to power their hydraulic systems. All the other teams used more traditional grinders/sailors. This innovation was paying off for them. Consistently the Kiwis had better boat speed and velocity made good (VMG). The most important difference between all the boats are rudders and daggerboards. The rudders have horizontal elevators to provide stability (provide righting moment, like the ‘keel’) counter balancing the tall fixed wing. The boards give the boats the necessary lift which allows them to get up on foil and fly, and counteract leeway. Every Team designed and manufactured multiple carbon fiber foils for use according to the wind conditions. Longer boards in light air to provide more lift, shorter in heavier air. By 9:00 am on race day the teams must decide which daggerboards and head sail to use based on their weather predictions for that afternoon. Make the wrong decision and you’d regret it. Don’t blow it now in the Challenger Final. Keep focused and keep calm. Most importantly keep on the boat! What no one could have predicted was that one boat would finish a race with one less crew person than they started with. In the last race of the first day’s racing, during a gybe Artemis helmsman, Nathan Outteridge, went for an unintentional swim. He lost his footing and went flying off the rear quarter of the boat. Team members scrambled to new positions. Had it been anyone other than the helmsman perhaps the Swedish Team may have been able to keep calm and carry on racing. Logistically it was impossible to maintain boat speed. 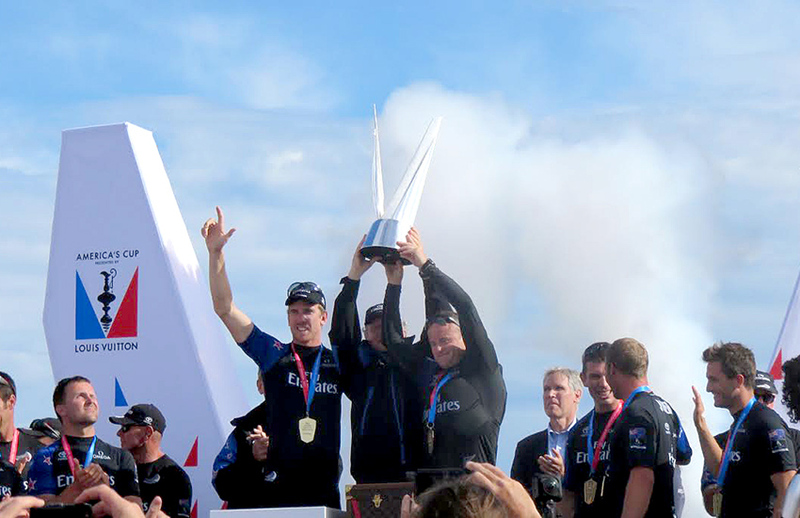 Emirates Team New Zealand capitalized on Outteridge’s misfortune and sailed home free. In other races Outteridge made unforced errors. Once he went out of bounds in spite of electronic warning systems on the boat. The penalty incurred lost them that race. In another race, an attempt to lee-bow his opponent backfired. Outteridge tacked too early, the boat was slow to accelerate out of the tack and the Kiwi boat just sailed over the top of him. By comparison Burling and the New Zealand team sailed several almost perfect races. Only once, in the final race of day two did he make a slip which was almost a fatal error. Burling misjudged the lay line when rounding the final gate heading to the finish line. The bows of the Kiwi boat plowed in, speed dropped and the Swedes came charging from behind with a full head of steam. Burling barely managed to hold onto the lead and squeaked across the finish line a mere one second ahead of Outteridge. Going into day three of racing the score was 4 to 2 with Burling at match point. The wind was light and variable. Iain Murray, Regatta Director, started a race but the fickle wind was dying away. On the final leg time ran out. Probably the best thing to happen – nobody wants to win a race that way. After a postponement a small front came through with enough wind to start another race. This time the wind held steady but was below 10 knots, mostly 7 – 8, barely enough to get the boats foiling. From the start Emirates Team New Zealand showed off their superior boat speed, consistently higher on the course and up to 4 knots faster than Artemis Racing. It was a very impressive show. Burling out maneuvered Outteridge at the start and took off for the first mark getting there six seconds in front. As cool and focused as always, once he was ahead, Burling never looked back. There was nothing the Swedes could do to make up the deficit. At the finish line the delta was almost a minute. So, now Emirates Team New Zealand will again face off against Defender ORACLE TEAM USA in the America’s Cup Match presented by Louis Vuitton. The match will be decided by the first team to get seven points on the scoreboard. ORACLE starts with one point up due to their win in the first Qualifier Series. Can Oracle win a third straight America’s Cup? Will New Zealand get their revenge after the come from behind trouncing by Oracle in San Francisco? You won’t have to wait long to see these two determined teams compete. Race 1 is on Saturday, June 17, 2017.